Following a long-held and frankly absurd desire to collect every interesting SF film available on DVD, I recently relented and ordered a copy of Phase IV, the only feature film to be directed by celebrated title designer Saul Bass. I say ‘relented’ because the DVD of this obscure 1974 film had sat in my Amazon wish list for a couple of years and I wasn’t entirely sure it would be worth it. But it turned out to be a genuine curiosity, a strange mixture of corny 50s style SF and early 70s dystopia. The story concerns the sudden appearance of sentience among an unspecified species of ant. The film has distinct Ballardian touches: Lesko and Hubbs, two scientists camping out in middle of the Arizona desert, are studying the formation of an ant hive mind, the most explicit expression being a series of rectangular monoliths built from sand by the ants. The purpose of the structures is unknown and their destruction by the scientists is the dramatic moment when the ants begin their final assault against the humans. While J.G. Ballard’s own fiction rarely ventured into such pulp tinged territory, Phase IV has moments that evoke the elegiac feel of the Ballardian desert. With its rocky expanses shot in Africa – although set in the US [already a Ballardian territory] – one could easily imagine Lesko and Hobbs drinking after work in one of the hotel bars in Vermilion Sands. The most obvious Ballardian connection is of course the sand monoliths, structures eerily reminiscent of the sentinels in Ballard’s short story ‘The Waiting Grounds’ (1959), but also familiar as generic elements in what has been called Land Art. Land Art typically features interventions into the landscape by artists working at various scales. At one end of the spectrum are artists such as Richard Long and Andy Goldsworthy, whose interventions had low impacts, like wearing down grass into a track, as in Long’s A Line Made By Walking (1967) or Goldsworthy’s structures using materials from various sites such as stones arrayed in circles, built into walls or mounds, on sites near where the materials were collected. At the other end of the spectrum are the massive and imposing structures of Michael Hesier’s City (1972-ongoing) where the artist has slowly built a series of city-scale ‘sculptures’ that evoke Mayan pyramids. Just as gigantic but perhaps less grandiose, James Turrell’s Roden Crater (1979-ongoing) is a volcano crater that has been slowly transformed into an amphitheatre for viewing the sky, while Walter De Maria’s Lightning Field (1977) features 400 stainless steel posts erected over a one mile by one mile field in the desert in New Mexico, attracting lightning strikes and reflecting the changing light of day and season. The common thread throughout many Land Art works is the use of geometric shapes and repetition, in part derived from the movement’s roots in Minimalist sculpture, but also perhaps a result of the effective simplicity of drawing lines and creating mounds and monoliths in dramatic expanses such as deserts and mountain ranges, an architectural form known to humans since ancient times, and visually powerful in their suggestion of time, entropy and the universe. Robert Smithson (1938–1973) created Spiral Jetty in 1970 and it has proved to be one of the key works of the Land Art movement. The work was built using black basalt rocks and earth at a lonely point on the shores of Utah’s Great Salt Lake. It is a giant coil some 1,500 feet long and 15 feet wide that stretches out counter-clockwise into the translucent waters near Rozel Point. When Smithson built the sculpture, the water level at the lake was at an historic low and, in the years since, it has only been occasionally visible. Visits to the remote location are now much easier than in the early 70’s and have attracted a special kind of adventurous art tourist. Smithson, as has been well documented, was a reader of science fiction. He read Ballard and appropriated Earthworks, his preferred term for Land Art, from the novel of the same name by Brian Aldiss. Smithson worked on a number of unrealised, explicitly SF themed projects including a documentary film on flying saucers, and drafted plans to build a monument in Antarctica [that has a possibly not-coincidental doppelganger in Adrian Veidt’s Antarctic base in the recent film version of Watchmen]. Smithson found within Ballard’s writing a significant point of reference for his own artistic ideas. In his essay ‘The Artist As Site-Seer: Or, A Dintorphic Essay’ (1966-7), Smithson cites The Waiting Grounds and its story of ambiguous and encoded monolithic objects as a key influence on his thinking at the time. Smithson theorised a cosmic scale for the potential of sculpture and architecture, speculating that certain forms like the Great Pyramid contain within them fundamental numerical/geometric relationships in their formal ratios, but also that monumental sculptures might also contain within them the seeds of language. The Great Pyramid, claimed Smithson, was an ‘awesome computer based on orbital chronologies and shifting calendars’ that ‘is an agglomeration of codes, puzzles, clocks, tombic theories, secret passages and lacunary mathematics’. Smithson’s hope was that his own work could somehow achieve this rich mixture of cultural and scientific reference. This semi-mystical view of sculptural form is reminiscent of various Ballard stories in which an artist or scientist labours at an obscure task that ultimately reveals a cosmic truth, such as the revelation in The Waiting Grounds that language precedes consciousness. In The Voices of Time (1960), another Ballard story cited by Smithson, and one often thought to be somehow connected to the Spiral Jetty, a cosmic countdown signals the approach of an eternity of sleep for humankind. The protagonist, Powers, after encountering a spiral structure meant to represent the square root of -1, surrenders to the flow of cosmic time within a spiral mandala, located on the salt lake of an abandoned air force testing range. Ballard’s use of the spiral as a symbol for cosmic time, from the scale of the sculpture to the magnitude of the galaxy, finds its expression in Smithson’s sculpture. Smithson was killed in 1973 in a light plane crash while he was surveying sites for new land art projects in Texas. Despite his untimely death, his work has proven influential for a subsequent generations of artists, and his estate’s website notes his art has been the subject of numerous major exhibitions in the Europe and the US since the mid-1970s. 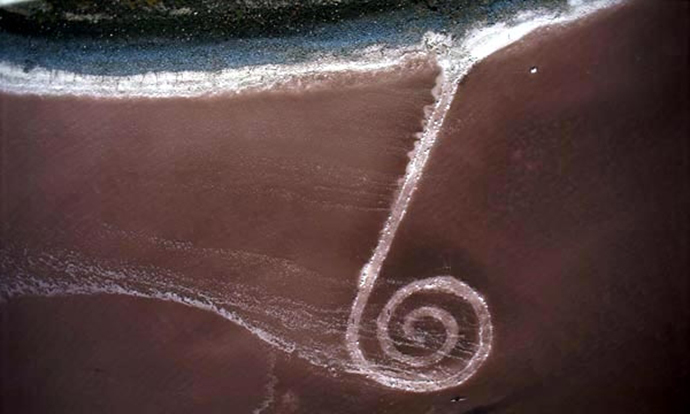 The Spiral Jetty itself now has iconic status, in part due to successive generations of artists looking to Smithton’s apparent purity of his intent and reasoning. That the Jetty has been literally lost to view for decades as it slumbered beneath the water gave it a ghostly presence in late modernist art; it was well known, documented on film, but it was literally hard to see in the real world. Smithton’s own film of the Jetty, with its zooms and swoops over the rocks and lake, and its voice over, a blur of tripped-out incantory prose quoting numerous sources including John Taine’s 1931 story ‘The Time Stream’, only made that ghost all the more alluring. In the mid-1990s, British artist Tacita Dean decided to see if she could find a trace of the Spiral Jetty. Traveling to Utah and using complicated directions to Rozel Point – located some two hours from Salt Lake City and 12 miles into the wilderness of the Golden Spike National Historic Site – Dean and her travelling companion became lost. Recording the trip using a tape recorder and a 35mm stills camera, Dean produced two key works from the trip, a sound recording, Trying To Find The Spiral Jetty (1997), and an installation projection of her 35mm slides, Rozel Point, Great Salt Lake, Utah (1999). The sound work was based on recordings of Dean and friend attempting to find the Jetty, which was later embellished and supplemented, turning the piece into an extended work of fiction. Ultimately the trip led the pair to the outcrop adjacent to Smithson’s work, but there was nothing to see except a vast expanse of calm water. Tacita Dean’s film project, JG, was a major piece inspired by Dean’s correspondence with Ballard, and in particular his observations on Smithon’s Jetty and his encouragement to her that she should ‘treat the Spiral Jetty as a mystery her film would solve.’ Dean revisited Rozel Point and recorded the landscape and the now visible Jetty. The work elaborates upon a technique she developed for an installation at the Tate Modern’s Turbine Hall in 2011 where the artist, using 35mm film, shoots and reshoots lengths of film using selective masking to create a visual collage of elements in the final image. Dean is interested, like Smithson and Ballard, in the repetition of visual and thematic elements at various levels. She likens the spiral of the analogue film loop to the spiral of the jetty and the spiral nebulae in The Voices of Time. ‘It literally sees time,’ Powers says of an experiment on a sunflower in ‘The Voices of Time’. So also does the spiral at the heart of all our biological, chemical and cosmological structures. As does, I realized as I worked at my cutting table, the indexical nature of film itself. ‘A film is a spiral made up of frames,’ Smithson wrote. JG needed to be made now because its medium and its form is the analog of the underlying equation of our universe, and it is breaking up and saying goodbye. A repetition of form, a mirroring of components and other aesthetic considerations may be found in their work, and these are interesting aesthetic considerations, yet it was Dean who effectively summarised Ballard’s modus operandi, and Smithson’s approach, namely a recognition of the poetry of the desert and the ruin, the making strange of our own time through an acute recognition of our place within what Smithson called deep time.